The entire Tezu township gripped in the festival fever during the Durga Puja celebration (Victory of good over evils) which commenced from 16th to 19th Oct. In the township two puja pandal were erected that illuminated with light at Shiva Mandir and Jubilee ground premises. Thousands of festival revellers and devotees were thronged the puja pandals were seen in queue to offer obeisance to the Idol of Durga (symbolize power). Devotees dressed in their best attire and laced with ornaments were witnessed standing for their turn with baskets of fruits to offer player to the goddess. Most of the devotees were also on fasting on the auspicious occasion of Nau Ratri as they belief that their several wishes and aspiration would be fulfilled bringing peace, happiness and prosperity in their lives. The Minister Dr Mohesh Chai also paid visit and offer prayer to the goddess to various Puja Pandals of the Tezu and Sunpura Constituency. In his festival message, Dr Chai appealed the public of Sunpura to uphold spirit of the festival and appreciated the public for organising Durga Puja every year without any difference. “The Maa Durga will always blessed for prevailing peace and harmony and brotherhood within us”, the Dr Chai prays. A live Durga Show was also major attractors for the public as displayed by the Brahmakumaris on the occasion. The Durga idols of various Pandals of the township were took to the procession in and around the township and peacefully immersed at TEZU Khola with all safety and traditional rituals. 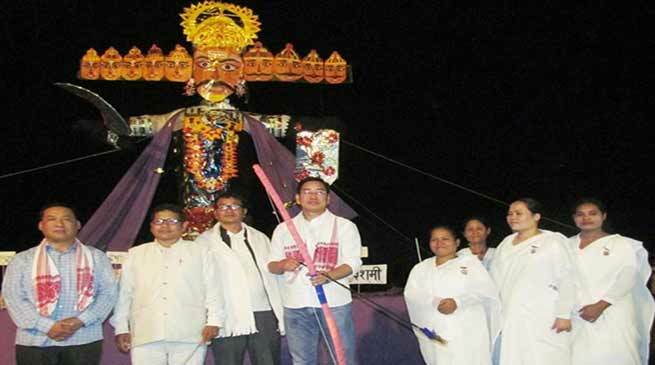 The BRAHMAKUMARIS also observed Dessehra Utsav at the Jubilee ground where Effigy of 15 feet Ravana was burnt. Dr Mohesh Chai as chief guest hit the Ravana from arrow to ashes who is symbolized evils (Anger, Ego, Attachment, Greed and Lust) to mark Dessehra here this evening at the Jubilee ground. A skit depicting five vices symbolizing ‘RAVANA’ and his demolition was visibly displayed by sisters and brother of the organization.